Suitable for both gas and electric hobs, this solid cast aluminium espresso maker by Bialetti makes 2 beautiful and strong coffees. Built to the high standards of Bialetti, this traditional stove top coffee maker also comes with a new unique valve system that helps produce a delicate crema on each coffee. Just in case the smart crisp lines of the Bialetti Brikka coffee maker wasn’t enough to convince you to purchase this £17 beauty, hopefully some helpful reviews will. Fantastic new design of the Brikka means you no longer need to keep the lid open when cooking on the stove as you did with the old design. 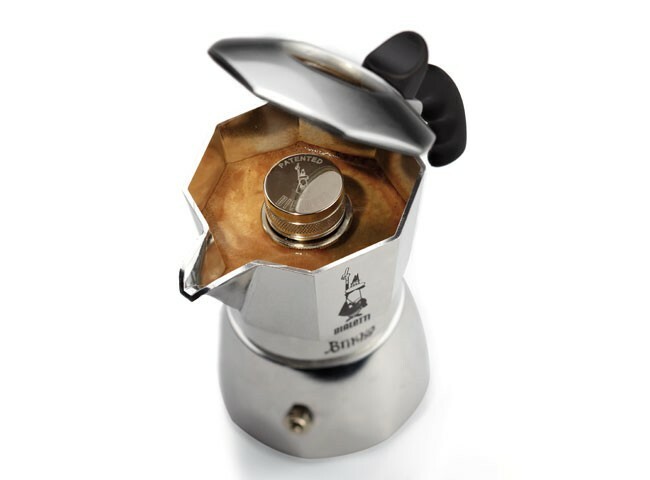 This Espresso Maker, is really that and must be distinguished from other stove top coffee machines of which I’ve tried many and none come close to coffee as good as made with the Brikka… The only downside to this machine is that you’ll quickly develop a taste for good tasting strong coffee. I get very disappointed with most of the coffees I buy from cafes, most just taste like hot milk to me. This entry was posted in Brewing Kit, Espresso Makers and tagged Espresso Maker, vintage on November 2, 2013 by Paul Kaffie.